It's a stunning piece of work. 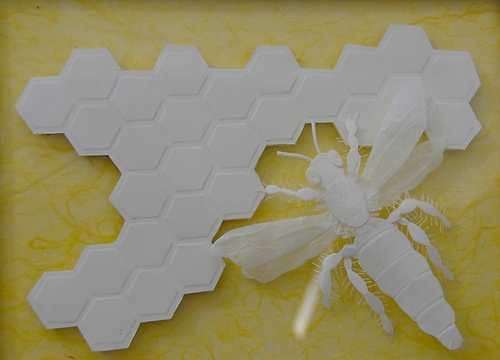 It's a three-dimensional paper sculpture of a queen bee. Noted artist Marilyn Judson (right) of Davis created the paper sculpture (below) now on display in the "Sticky Business: Art of the Honey Bee" show that runs through Dec. 23 at the Pence Gallery, 212 D St., Davis. Gallery hours are Tuesdays through Sunday from 11:30 a.m. to 5 p.m.
Judson has been around "bugs" all her life. 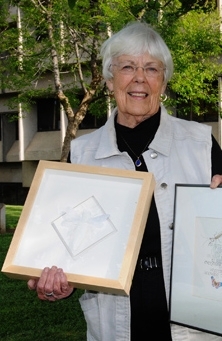 Her husband, Charles Judson, is an emeritus professor of the UC Davis Department of Entomology. Judson specializes in paper sculpture, calligraphy and watercolors. She has displayed her work throughout the area and worked in partnership with Davis artist Donna Billick in creating area murals. She is one of 11 artists showing their work, which includes paintings, monoprints, sculpture and photographs. The gist of the show is to incorporate "themes of environmental conservation with beautiful and thought-provoking fine art on the subject of the honey bee,” says curator Christopher Beer. And to point out the plight of the honey bee.